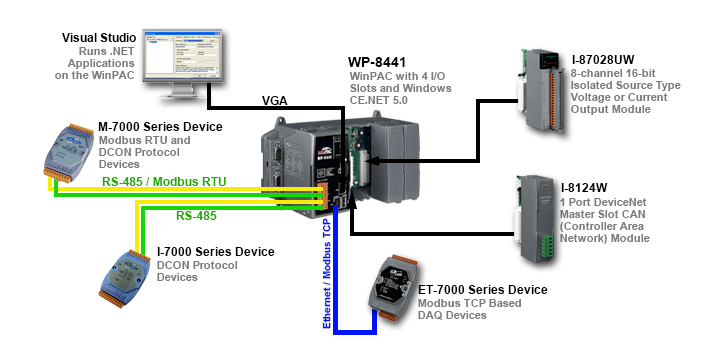 WP-8441 | WinPAC Programmable Automation Controller with 4 I/O Slots and Windows CE.NET 5.0. Supports operating temperature of -25°C to +75°C. Comes with Free eLogger Configurable Control and Monitoring software. 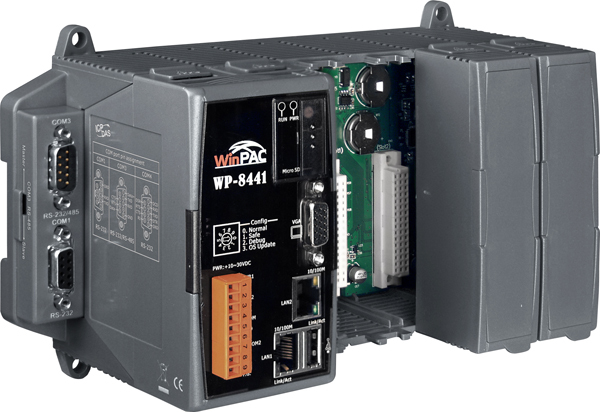 WinPAC Programmable Automation Controller with 4 I/O Slots and Windows CE.NET 5.0. Supports operating temperature of -25°C to +75°C. Comes with Free eLogger Configurable Control and Monitoring software. 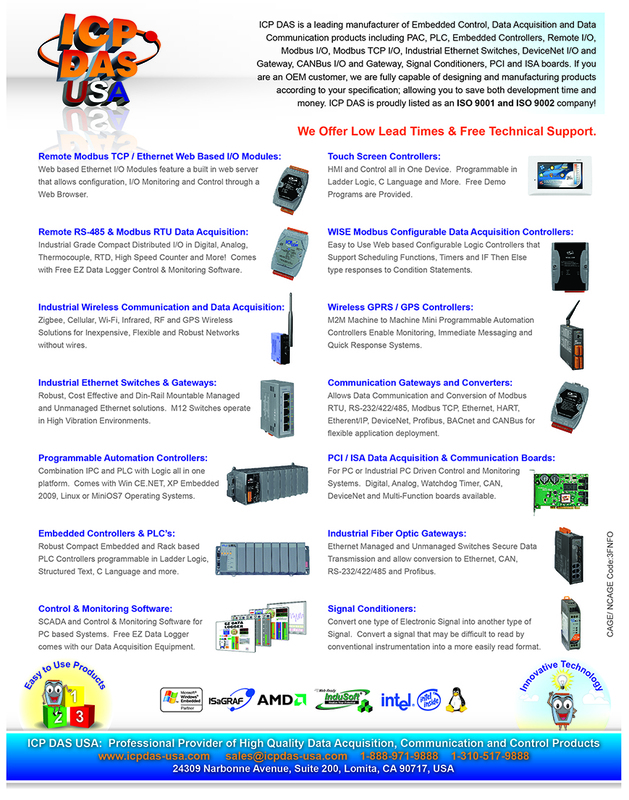 The WinPAC-8441 is the second generation PAC of ICP DAS USA. It is equipped with a PXA270 CPU (520MHz) running a Windows CE .NET 5.0 operating system, various connection types (i.e., VGA, USB, Ethernet, RS-232/485), 4 slots for high performance parallel I/O modules (high profile I-8K series) and serial-type I/O modules (high profile I-87K I/O modules). It is compatible with eLogger software. Its operating system,Windows CE 5.0, has many advantages, including hard real-time capability, small core size, fast boot speed, interrupt handling at a deeper level, achievable deterministic control and low cost. Using Windows CE 5.0 with the WinPAC-8441 gives it the ability to run PC-based Control software such as Visual Basic.NET, Visual C#, Embedded Visual C++, SCADA software, Soft PLC, etc. The FTP server is used for uploading applications or downloading data. And VCEP is designed for managing the WinPAC-8000. VCEP can synchronize every movements (screen, keyboard and mouse actions) between the PC and the WinPAC-8000 via the Ethernet. By using the FTP server and VCEP, you can update and manage the WinPAC-8000 remotely via the Ethernet. The FTP server is used for uploading applications or downloading data. 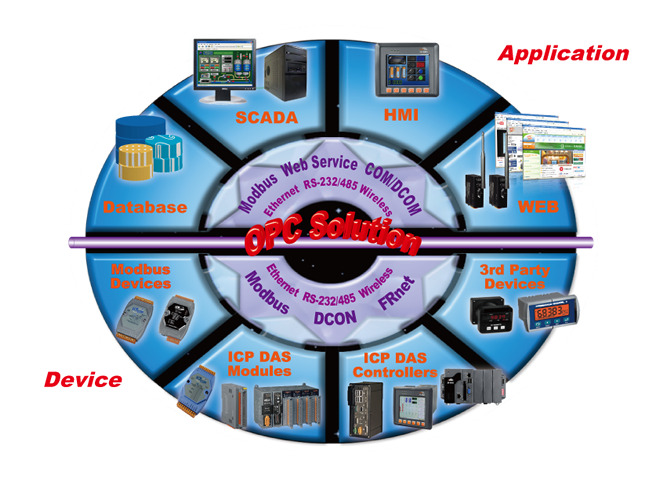 VCEP is designed for managing the WinPAC-8000. VCEP can synchronize every movements (screen, keyboard and mouse actions) between the PC and the WinPAC-8000 via the Ethernet. By using the FTP server and VCEP, you can update and manage the WinPAC-8000 remotely via Ethernet. Users can upgrade their controller from WinCon-8000 to WinPAC-8000, still keep most of their old applications (.exe files) running smoothly on WinPAC-8000 without any modifications. 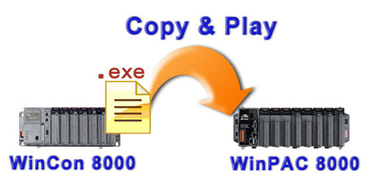 The only thing that users have to do is copy the .exe file from WinCon-8000, paste it to WinPAC-8000, and play it. It's that simple. For exceptions in old applications (.exe files) that are not able to follow the copy-and-paste rule, users can still upgrade by recompiling the old applications. The upgrade process does not take more than 7 steps. A built-in VGA port can be directly connected to a regular LCD display. Users can operate the HMI or SCADA software (running on the WinPAC-8000) with display, keyboard and mouse just as how they usually did on regular PCs. The 64-bit hardware serial number is unique and individual. Every serial number of WinPAC-8000 is different. Users can add a checking mechanism to their AP to prevent software from pirating. 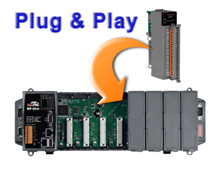 The WinPAC-8000 features hot swap which means that there is no need to power off the WinPAC-8000 for replacing modules. And the OS provides a function sending plug-in and removing messages to user’s applications. Using this feature, users can design their own plug-and-play applications. 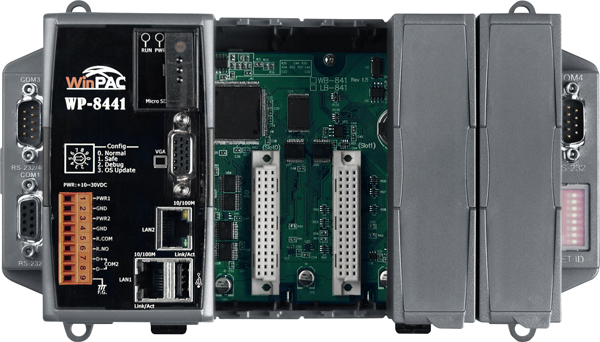 Beside the local I/O slots, WinPAC-8000 also equips several RS-232/485 ports, two Ethernet ports to connect serial I/O and Ethernet I/O. And with FRnet and CAN communication module in local slot, FRnet I/O and CAN devices are easy to be integrated. Uusers can store their AP or data to the Micro SD card or USB Flash disk. The built in Flash disk is the best storage media in vibrational environments like in ships or trucks. There are two watchdogs (OS watchdog and AP watchdog) designed to automatically reset the CPU when systems could be hung up from situations like OS or AP failure. The dual watchdog design increases the reliability of the system. Non-Volatile memory is the ideal design to maintain important data while power off. 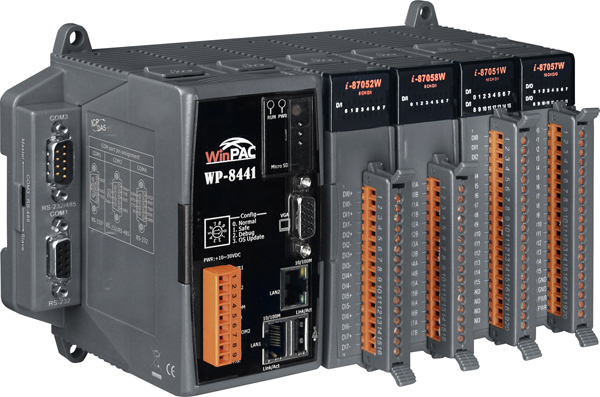 The WinPAC-8000 equips a 512KB SRAM with two Li-batteries to maintain data while powered off. The two Li-batteries continually supply power to the 512KB SRAM to retain data for 10 years; the dual-battery design prevents data loss when replacing a new battery. WinPAC-8000 provides two Ethernet ports. The two Ethernet ports can be used to implement redundant Ethernet communication and separate Ethernet communication (one for global Internet, one for private Ethernet). The power module is designed with two inputs to prevent the WinPAC-8000 from failing by the power loss. The WinPAC-8000 can keep working even one power input fails, and mean while there is a relay output for informing the power failure. Each WinPAC-8000 is housed in a plastic-based box with a column-like ventilator that can help to cool the working environment inside the box and allow the WinPAC-8000 operating between -25°C and +75°C. VGA WP-8x31: resolution: 1024 x 768, 800 x 600, 640 x 480; with one extra GPU. WP-8x41: resolution: 800 x 600, 640 x 480; without extra GPU.